We Bee’s woke up and had plans to go to the Korea International Exhibition Center, also known as the KINTEX Convention Center, to check out our friends Scuba Diving booth along with some others at the 9th Annual Gyeonggi Tourism Expo. Not quite knowing what to expect from the Expo, we still were excited for a new adventure! The drive was a little under an hour from our place in Dongducheon. The time really just flew by and the next thing we knew, we were already coming up the Ilsan exit. Driving into Ilsan we could see this massive building structure. We could make out the letter on the building pretty easily and were fairly positive that this was the place we were looking for. WOW! This place is just ginormous and has a really crazy wave-like shape to it. The KINTEX Center opened in 2005 and spans 224,795 m. There are five exhibition halls that span 53.975 m. plus just this year they expanded into a second exhibition center that provides the building with 54.508 m of extra exhibition space! The KINTEX website says, “that with the combined exhibition areas of 100,000 m from the first and second Centers, KINTEX is Asia’s 5th largest and world’s 34th largest exhibition and convention center. Go big or go home, huh? When entered into the building we were still just amazing at the size of the Center. There were tons of booths set up as far as the eye could see. The first booth that we saw was a facial stand. Surrounding booths were make-up, hair, skin care, etc. Pretty cool! We walked around the expo with Mr. B’s friend and checked out different countries like Egypt, India, Japan, etc. Each booth had something different to offer, whether it was informational or free gifts, all geared towards getting you to go visit and travel their country. We were handed all sorts of materials. 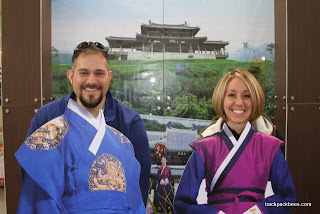 We looked at a bunch of different booths on Scuba diving, drank various teas, mashed soybeans, Facebook LIKED Korea tourism’s site, ate rice cakes, sipped Gyeonggi Rice Makgolli, bought Yakgwa (Korean Fried Honey Cookies), and snapped some fun pictures. We had a blast! The Center is located at Daehwa-dong Ilsan-seoug, Goyang-si, Gyeonggi-do, Korea. For more information on upcoming events at the KINTEX Convention Center visit www.kintex.com, plus there is an English site too! The fun had to end. We were on a time crunch to get back to our place to get changed and catch the train to Seoul. Tonight was Mrs. B’s second work party just with the ladies that she works directly with. The reservations were at the Korea House for a traditional Korean dinner and show. Well, we missed the first train by minutes because of a wardrobe malfunction. We caught the second train twenty minutes later and were off. We transferred from line one to line four. We got off at Chungmuro Station Exit 3. The restaurant was incredibly easy to find! As soon as you come up the steps from exit 3 look to your right and you will see a gas station and the Korea House sign right behind it up on a building. Bam! You are there! We had a wonderful time at the Restaurant with all of the dinner guests. We learned some new Korean foods and how to serve and prepare them as well. We also really enjoyed the show afterwards. The music was beautiful and the cast had incredible singing voices. (We included some photos of the cast in the attached album). The address for the Korea House is, Seoul-si Jung-gu Pildong 2(i)-ga 80-2. To make reservations or find out more information about the restaurant or shows you can check out the website here. After the show we decided to grab some drinks at place nearby in the Myeong-Dong area at Bier Halle. We had so much fun just laughing, drinking, and eating. We thought it was very comical that Mrs. B’s co-workers were using chopsticks to eat nachos. You know what they say… only in Korea! Ha-ha! It was getting late and we still had to take the train back to Dongducheon. We all left and ventured back home. What did you do on your Saturday?